This vibrantly patterned three-piece quilt set contributes an air of carefree fun and youthful exuberance to any bedroom. 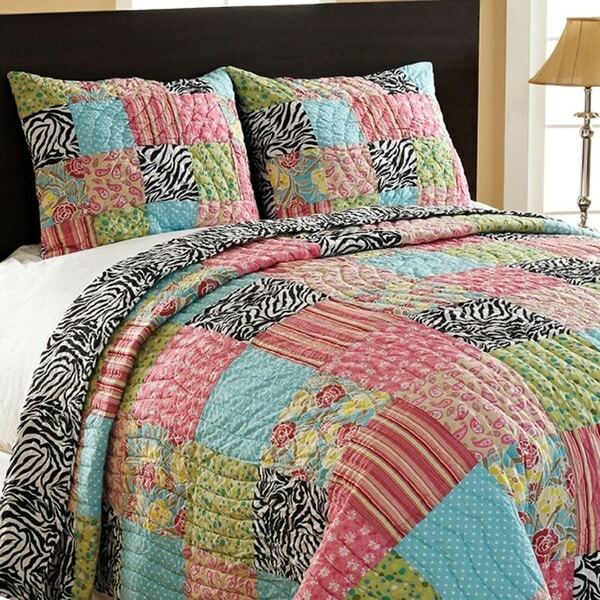 Featuring a festive patchwork of zebra, stripe and solid prints in an array of dazzling hues, this reversible quilt set is crafted with 100-percent cotton for optimal softness and easy care. This quilt is exactly as pictured on the web. The colors are great and my daughter loves it. The zebra patchwork allows for nice zebra accents in other parts of her room. It is a nice weight for all seasons and the size is good for the mattress. Shipping was prompt and the item arrived in good condition. This quilt is well made and a perfect weight for Arizona's climates. The size is awesome because it fits and covers (with room to spare) a deep mattress even with a down blanket under neath for cooler months. I argue with my 8 year old about which way to use the quilt because she LOVES the zebra print. The quilt has a lot of different colors that you can pull from and use as accents. My daughter has decided pink isn't her thing so much anymore and this was the perfect way to tie in the old with the new. We pulled the turquise shades with accessories and it's perfect! I also ordered a solid black dust ruffle from O and it's the perfect look. This is also a nice style that kind of bridges the gap as your kid is getting older.... it's a trendy style that would work for a wide age spread, probably any age actually. There's a lot to work with because of all the patterns and colors in the patchwork. You can go in any direction depending on who it's for. You can cutz it up for a kid or go in a more mature direction with accents too. Ordered this for my grandaughters bedroom and it is perfect and the price was very reasonable for a king size quilt. It's very colorful and the black and white zebra print will transition as she gets older. Almost everything is compatible with it as far as furniture and accessories. It's very soft and will get even softer with use. Very well made, even the shams have ties to keep the back closed like they have on expensive shams. Couldn't be happier with my purchase as I always seem to be with anything I order from Overstock! We bought this quilt for our daughter's room. She loved the pattern and loved the colors, although it wasn't as bright as the photo shows. However, after the first washing it started coming apart at the seems. I was able to stitch it up - but after a few months it really started coming apart, to the point of needing to reinforce the entire top. Ain't nobody got time for that. Design is a great balance of sweet and sassy! This was the perfect find to redo my 8 year old daughter's room with! I looked long and hard for a quilt set that wasn't too girly pinkyish nor too teenager looking. I instantly knew this would be perfect. When I got it, it was even cuter in person! We are doing light blue walls, white furniture, and black accents with pops of bright pink & yellow throughout. Very cute! What a beautiful quilt for my 6 year old's new 'big girl' room! Wanted a zebra theme that wasn't overwhelming or too teen-ish. This quilt is perfect. The colors are much bolder and cuter than the picture shows and you can go any direction with wall and accessory colors. You can look up the matching pillow Overstock sells and see the colors better. It appears to be well-made, but we haven't washed it yet. *** is a great brand and you would pay over $400 for this set on their site! 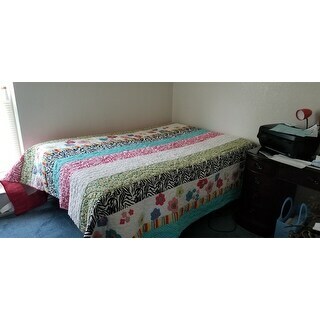 I ordered a bedskirt from *** that is from the 'new' *** pattern quilt and am hoping it will match! My daughter's preferences are changing to something a little bit more mature than princess motifs but yet still girlish and fun. This fits the bill. She thinks the zebra print is a little daring and yet the bright colors still match her decor. She wa thrilled with this quilt. It is also a very comfortable weight for Florida weather. I was extremely pleased w/ this bedspread. I was changing a little girl's room to a guest bedroom. I had pink walls and rugs! This bedspread kept the charm in the room while the squares of zebra print modernized a "flowery" bedspread. The spread is light in weight and true to size. I bought a zebra print bedskirt and throw. Am very pleased and feel the room took on a new look for very little money. My girls love this bed set because of it’s nice quality and bright colors! We love how it is reversible too so that we can change things up from time to time! Well, first off I'd like to say that the item I received was Not the item I ordered. I didn't bother to call to notify anyone at overstock.com because for one I didn't have the time to return the item for as I was in the process of moving after having loss a family member too. Besides I had already thrown away the original packaging it came in. I had to much going on and didn't want the hassle. Now the item did have some similarities as the one that I ordered but was just not what I had my heart set on. I am Very Disappointed. This was my first time to order and ya'll couldn't even get it right. I really enjoy this bed set, its bright, and gives my African bedroom some pop of color, goes nicely with my decor. Quality wasn’t as good as I expected but it is very cute!! Love the print and reversible options for this quilt. Purchased two for my girls' room. While the colors have stayed vibrant, the stitching on the quilt squares side didn't hold up well to gentle washing and drying. Really cute. Buts the black faded very quickly. It is very well made. This quilt is darling and brightens up my daughter's room. However, after washing (only 6 or 7 times) the striped quilt squares have begun to shred. That material is noticeably thinner than the others. Disappointed since it was fairly expensive in my opinion. Because it had zebra print like my daughter wanted, but with a classic look that I wanted. The multiple colors will work with my daughters crazy paint in her room. "Hello, Are the queen and twin dimensions correct? What about the sham dimensions for a king and queen? None of these sizes are comparable to any quilt set! :) Sham for twin is right, but differs for queen? Sham for king isn't the standard size for either one. What size pillow does it fit? By the way, I'm not getting emails with responses altho subscribe to them. :) Thanks for having all of this checked out, Jeanie"
Hi Jeanie, we were able to verify this information with our support team. The size for the sham included with the twin and queen are standard shams measuring 20 x 26 inches. The sham included with the king quilt is a king sham measuring 20 x 36 inches. We confirmed the queen quilt is 90 x 95 inches and the twin quilt is 70 x 90 inches. We will have these changes reflect on the page as soon as possible. Thank you for bringing this to our attention. Unfortunately we are experiencing severe delays with answering questions and appreciate your patience. Please know that we are working diligently to expedite all answers as soon as possible. Thanks Jeanie ! "Will you be getting the queen quilt in stock?" Hi darrenandjamie, thank you for your inquiry. Items are restocked as they become available, however we cannot guarantee an item will be restocked. Please feel free to check back with us periodically to see if the item has returned.